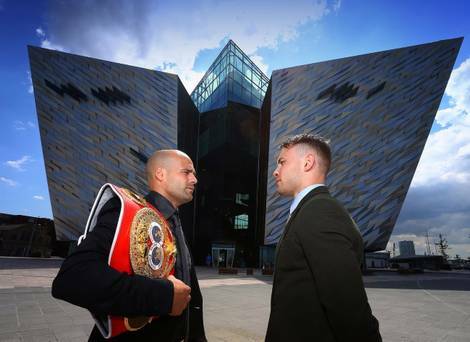 The Titanic Quarter will play host to Carl Frampton's much anticipated world title showdown with Kiko Martinez on September 6. The venue for Frampton's first world title shot was revealed at a press conference on Tuesday. Despite Ravenhill, the Maze and Balmoral Showgrounds all being speculated on as possible big show venues, Cyclone Promotions had kept the actual location under wraps until today. Both champion and challenger came face-to-face in a formal situation for the first time since their February 2013 encounter. Frampton came out on top on that occasion, blasting the Spaniard in nine rounds for the European super-bantamweight title. A repeat victory in the rematch will land Carl the coveted world crown live on BoxNation TV. Frampton stated on social media last week that he is looking forward to seeing his "wee friend" again and renewing a rivalry that has often threatened to turn ugly. "I hope it's fiery. He has been saying a lot on Twitter, but let's see if he is like that when he comes over because he has been tamed," said Frampton. "He's already been knocked out, so he can't be too brash because he will look foolish. "There will be no problem with me getting motivated as there is a world title on the line. "I'm going to be in front of the biggest crowd I have ever boxed in front of but there will be no issues with that on my part. "I think he's a slightly better fighter now but I know how much I have improved as well."